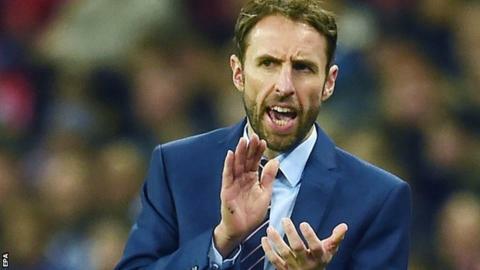 Gareth Southgate is "the only candidate" to become England's next full-time manager, claims former FA executive Adrian Bevington. Southgate, 46, will meet the FA hierarchy on Monday for what is effectively his interview for the role. "There is a board meeting on 30 November of the main FA board and I think Gareth will be the manager by then," Bevington told BBC Radio 5 live. "I don't think they will be speaking to anybody else." Southgate has just concluded a four-game stint as interim manager following Sam Allardyce's departure in September, beating Malta and Scotland and drawing with Slovenia and Spain. He will be interviewed at St George's Park by a panel including FA chairman Greg Clarke, chief executive Martin Glenn and technical director Dan Ashworth, as well as League Managers' Association chairman Howard Wilkinson and former England defender Graeme le Saux. "I think Gareth is the only candidate because he has earned it, he should get it and he is the right man for the job," Bevington, who was managing director of Club England from 2010-2014 and spent 17 years at the FA, told BBC Radio 5 live's Sportsweek. He said the FA "need to be promoting English coaches" after previous experiments with foreign bosses Sven-Goran Eriksson and Fabio Capello. Should Southgate get England job? "I found Capello and Eriksson very relaxed about dealing with the media. They didn't seem to be affected by that in any way but I genuinely believe the England team should be managed by an Englishman," Bevington said. "There are number of phrases used to describe Gareth - he's a bit too soft, a safe pair of hands, a company man. "But he is very intelligent and highly experienced football player and coach at international level. He's the most suitable person out there and the last two months, particularly the performance against Spain, have enhanced that. "I've spent a lot of time with Gareth and his interaction with the players is fantastic. If you talk to him privately you understand what his beliefs about football are, that's why Arsene Wenger is a great admirer of Gareth, that's why his beliefs in football are first class." Football Daily podcast - is there a better option for England than Southgate? The FA insists there is no time frame for making the appointment, with England's next game a friendly in Germany in March, and the final decision will be taken by Clarke, Glenn and Ashworth. The organisation is determined not to be rushed into an appointment and wants to conduct a thorough process, although no other interviews are currently scheduled and Southgate is firm favourite to take over on a full-time basis. FA chief executive Glenn said after Southgate's final game in interim charge: "Clearly his candidacy has become much stronger. We just need to weigh up the facts and take time to make the right decision."